Arguably the least successful pedestrian walkway in Toronto is the PATH, a labyrinthine maze of underground passages filled with retail boutiques that honeycombs the underside of the city’s business district. Meant to make shopping and foot traffic fun, it is instead a vaguely depressing place, hard to navigate, often low of light, and most frequently used simply to get from Point A to Point B whenever bad weather dictates. 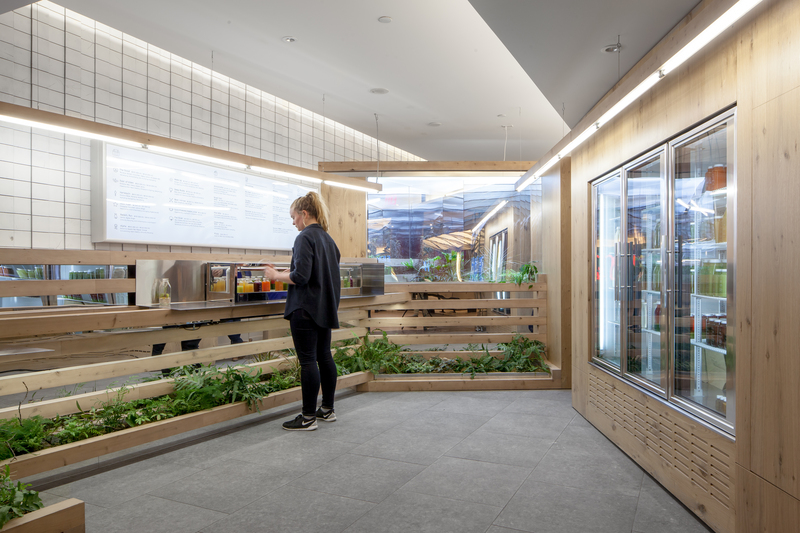 Into this arid, uncompromising milieu, the Toronto design firm of Kilogram Studio has injected a note of realistic relief, constructing a mini-oasis for the customers of its client, Greenhouse Juice Company. Or perhaps a mini-greenhouse offers better imagery, since the 950-sq.-ft. space lends the bulk of its frontage to two huge, mirrored terraria, alive with plants, flanking either side of the entry. Passage through to a considerably smaller, triangular interior (punctuated at its tip with yet another terrarium) is delineated by raised cedar-wood planters. Packed with leafy greens and backed by faux farm-fencing, these funnel people through to the pre-packaged bottle fridge or to the cold-pressed organic juice bar. 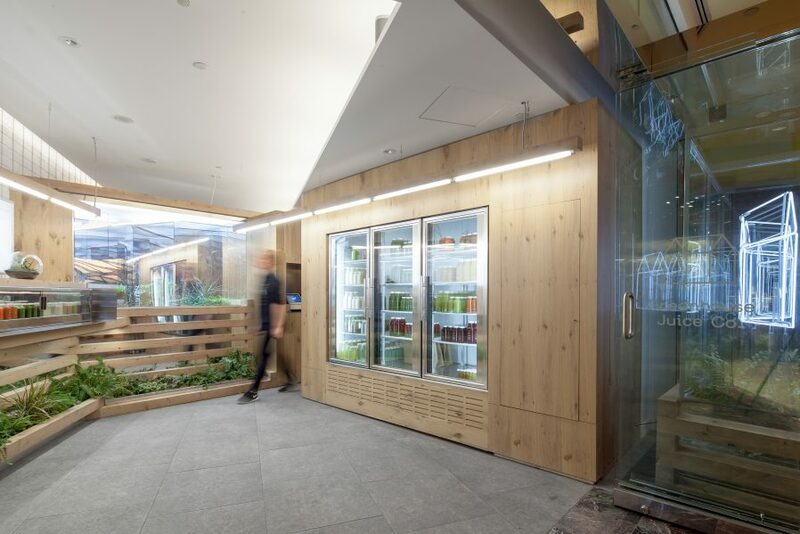 Cleverly called Grow-Op, the juice bar’s interior is lined with prefabricated cedar that not only saved valuable construction time but can be rearranged, or disassembled and relocated, according to the whims of the retail market. The soft yellow wood, like the greenery, offers a warm contrast to the rather cold materials – stone, glass and terrazzo flooring – used throughout the rest of the commercial concourse. Kilogram Studio principal Kfir Gluzberg has also cunningly referenced U.S. artist Phillip K. Smith’s work Lucid Stead through the positioning of various mirrored elements within the site to “reflect the flora and extend perception of the depth of the space.” Mirrors are spaced between the stacked cedar blocks at the back of the bar and in the terraria supports; the terraria themselves are fitted with two-way mirrors that both reflect and extend the small shop’s sensation of infinite perspective. Floating inside each of these boxes is the Greenhouse logo, a 3-D line drawing of a house rendered in white neon. 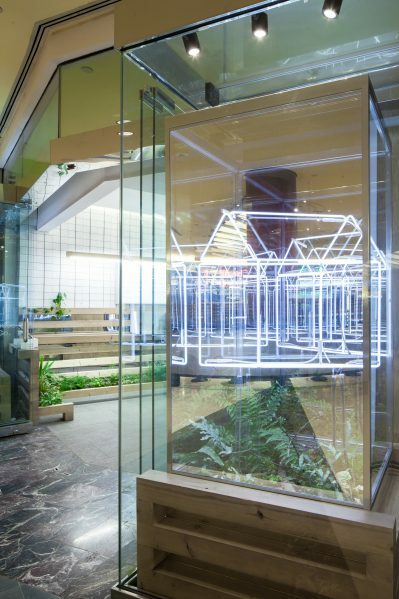 The greenhouse-within-a-greenhouse-within-a-Greenhouse concept is so clever that it appears Kilogram Studio has, at last, given Torontonians a legitimate reason to follow the PATH.